The cost of relocating staff to Singapore has fallen compared with 11 other global cities, according to a new survey. It found that Singapore slipped from the sixth-most expensive in December to seventh in June. Property company Savills compared the annual cost of renting living and working space for a group of employees in the financial and creative sectors. London, Hong Kong and New York emerged as the most expensive cities, largely unchanged from six months earlier. The scarce supply of space has driven up rents in some cities, said Savills. 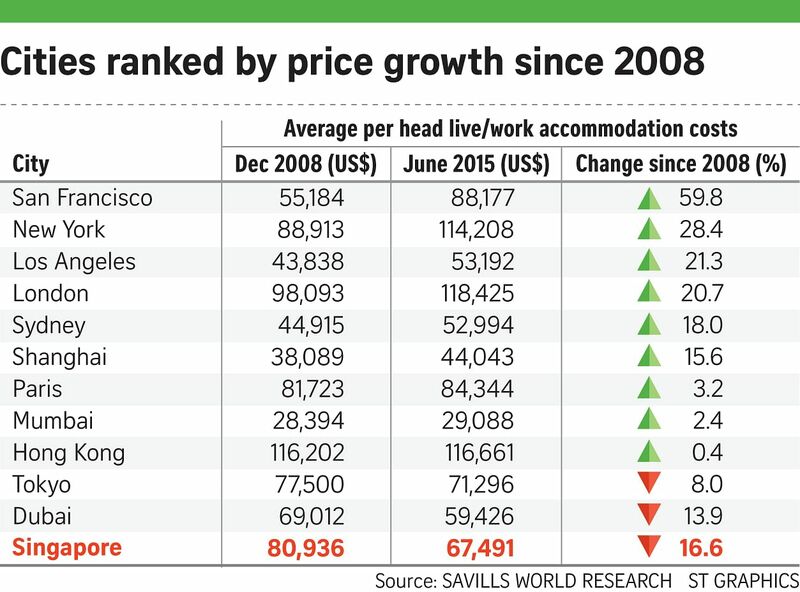 Live/work costs - or residential and office accommodation costs per employee - in San Francisco shot up 59.8 per cent from December 2008, when the index was launched, to June this year. They rose by 18 to 28.4 per cent in New York, Los Angeles, London and Sydney over the same period. On the other hand, live/work costs plunged in cities with more space. Singapore recorded the biggest decline at 16.6 per cent from 2008. The only other decliners were Dubai, where rates fell 13.9 per cent, and Tokyo, where they were down 8 per cent. "Lower demand particularly from expats due to economic conditions, coupled with high supply and rising vacancy rates, have been the key factors at work in Singapore, both for residential and commercial property," said Ms Yolande Barnes, director of Savills world research. The decline in live/work costs could also reflect high growth and relatively high levels of rents before 2008, she noted. Cheaper rents could make property more affordable and may be seen as a competitive advantage globally, although others could see rising rents as a sign of a city's success. While the immediate outlook here is for further falls in rent due to rising supply and muted demand, longer-term economic prospects are set to improve, Ms Barnes told The Straits Times. "Singapore is well positioned to see increased corporate leasing activity - both residential and commercial - as more businesses set up in the city to take advantage of both the proximity and links to Asia-Pacific and the high-growth Indian sub-continent." Savills also measured real estate affordability, comparing the per head accommodation costs with per capita gross domestic product for each city. It set out to answer the question: Is the economic growth of these cities able to keep pace with rising rents? Sydney and Los Angeles proved to offer the best value, with live/work rents at just 70 per cent and 80 per cent of GDP per head. Mumbai was the most expensive relative to GDP, with rents at five times of GDP per head. "This reflects the fact that most workers in the city do not live and work in the international-standard accommodation that Savills measures," said Savills. Singapore came in with rents at 120 per cent of GDP per head. "(This) implies real estate capital values are on the high side in relation to local incomes and wealth," said Ms Barnes. "This means that capital values will start to grow only when the fundamentals improve... Investors will be waiting for rental growth, or strong prospects of rental growth, before they start paying more and begin to push capital values up again." She projected a period of "short stagnation followed by medium-term rises, in line with GDP growth, wealth creation and rising household incomes". Yet Singapore is still good value for companies on the international stage, given a healthy business environment and position between India and China, Ms Barnes added. "Like all world cities, Singapore will need to adapt to the digital age and new working practices... The quality of life it offers, especially in the context of the rest of Asia-Pacific, will help it to attract the human capital needed to succeed in this age. We are consequently quite bullish on the long-term outlook for Singapore real estate."